An Inflationary Bust Or …? 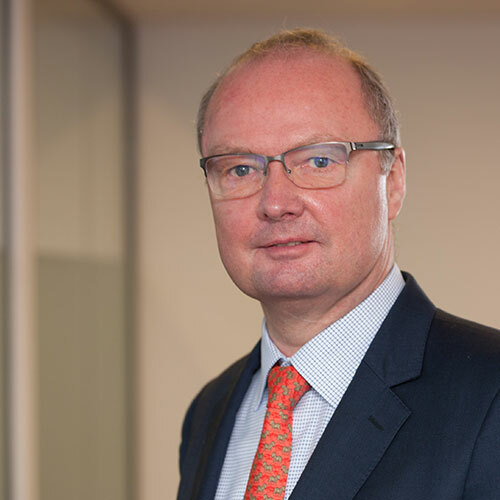 Events of recent weeks suggest that we have now entered the final stage of the long-running bull market in equities, but what will happen next? An inflationary or a deflationary bust? We argue that, as we see things, the more likely end-game is an inflationary bust, but we do admit that the arguments in favour of a deflationary bust are quite pervasive. Regardless, a bust is next, and a bust is still a bust. Always set your goals higher than you could ever possibly reach. That way, when you barely fall short, you're still better than everybody else. This month’s Absolute Return Letter is the last before my book comes out, which is scheduled to take place on the 26th March (Exhibit 1). Writing a book has been a most enjoyable experience but, at times, also a terrifying one. More than a few nights have been saddled with bad dreams about my family being the only ones prepared to buy the bloody book! Being new to this game, I have no idea what to expect, but I can guarantee you that I haven’t just written another Harry Potter. Even the best financial books sell only a fraction of what novels typically do. That said, how many should I expect to sell? I honestly don’t know, but I do realise that I am a nobody to the regular customer walking into a bookstore, looking for an interesting book on finance. If my surname were Buffett, more than a few punters would probably pick it up just because of that, but it isn’t. The End of Indexing at Amazon or here: The End of Indexing at Harriman House. Until the 26th January, everything was plain sailing in global equity markets, and investors went to bed that evening, knowing that the S&P 500 had just closed at another all-time high. The next day the tide turned, although losses were at first relatively modest. Having said that, in less than two weeks, nearly 10% had suddenly gone out the window. What had changed so abruptly? Why this sudden pessimism? Why did investors turn negative only a day or two after being prepared to pay record high prices for equities? To begin with, allow me to go back to the quote I used to open my January letter with: “It is not bad economics that will send this market lower. It’s good economics.” (Quote: Kerrin Rosenberg, Cardano UK). At first glance, it certainly looks like a case of good economics suddenly turning into bad economics, so let’s dig a little deeper. Every single attempt to explain the recent change in investor sentiment that I have come across argues along the same lines. 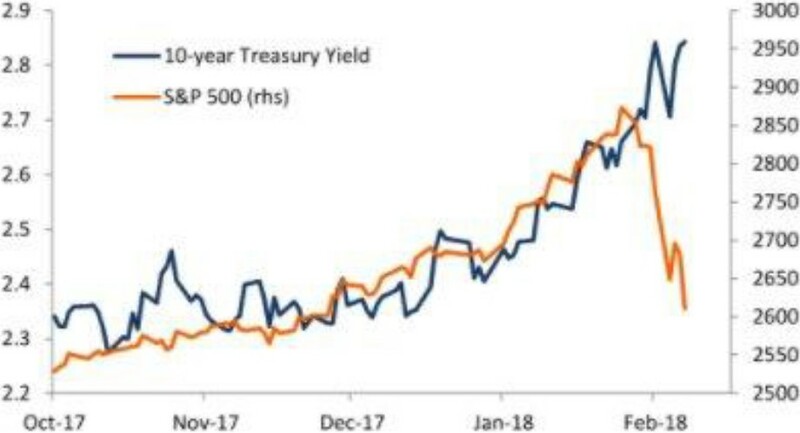 Yes, economic fundamentals are rather good at present and, yes, those fundamentals are driving interest rates modestly higher, but there is a limit as to how much of a rise in interest rates equity investors are prepared to tolerate. Allow me to ask a very simple question then: Was it really the recent rise in interest rates that started the sell-off? If it was, why didn’t the first 40 basis points matter? Why only the last 15 basis points (Exhibit 2)? That said, it is not just a story about modestly rising interest rates; there is far more to it than that. The true culprit was (and still is) a genuine fear of a much more serious bout of inflation than anything we have seen for many years – in other words a fear that the Fed is now firmly behind the curve. Why that fear is also quite valid, you shall see in a moment. Is the Fed really behind the curve? It appears to me that investors increasingly subscribe to the view that the Fed is behind the curve. Allow me to make a few points in that context. As we all know, most investors take a long look in the rear-view mirror when planning for the future. 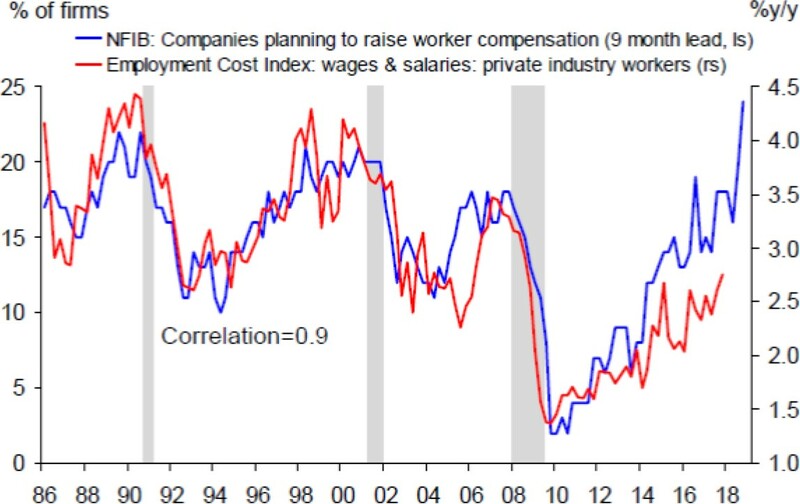 They look at trend lines and, in the case of US wage inflation, the consensus view is (or at least was) that there is nothing to worry about. The recent increase in hourly earnings is only marginal, they say and, at first glance, I would probably agree. Moreover, many bulls have pointed to the US Phillips curve and have argued that, as long as it is as flat as it currently is, there is absolutely nothing to worry about (Exhibit 3). 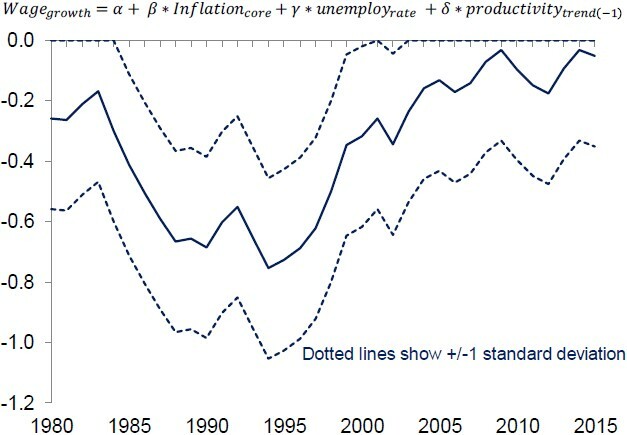 (Note: A flat Phillips curve implies that high employment levels should have virtually no impact on inflation). As you can see, back in the 1990s, a 1% drop in the unemployment rate led to a 0.6-0.7% increase in inflation. Nowadays, inflation is virtually unaffected by the high level of overall employment that the Americans currently enjoy. On that basis, how can one possibly argue that that Fed is behind the curve? This is where things get interesting. As you may recall, just before Christmas, Donald Trump managed to get his landmark tax bill through Congress, and the new tax code means a dramatically reduced corporate tax rate for US businesses. A significant number of US companies have since announced that they wish to share the upside with their employees; i.e. meaningful pay rises have been announced but not yet effectuated. What the bears argue is that looking in the rear-view mirror is meaningless, as the announced pay rises will only happen later this year. Based on work conducted by Deutsche Bank, a very different picture now emerges (Exhibit 4). As you can see, planned pay rises correlate very highly with the employment cost index, so long as you incorporate a 9-month time lag. Economic slack is a poorly defined economic term. I cannot present a formula for it, because no such formula exists, but it is an economic term that depicts the mix of employment conditions and the output gap. 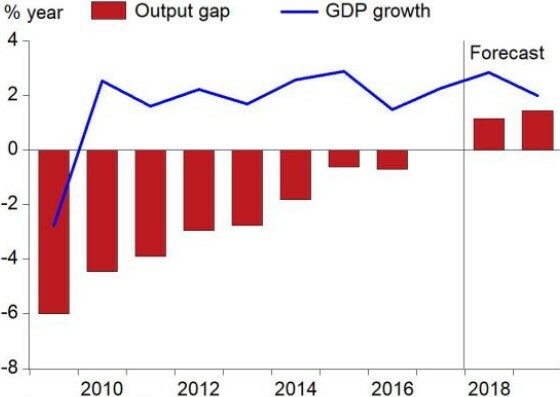 The output gap is quite a simple economic term. It measures the difference between actual output (typically GDP) and potential output, assuming the economy is running at full capacity. In other words, how much more output could we generate, if we fired on all cylinders? We just learned that US employment conditions are extremely robust at present, so it would only be fair to assume that there is little slack on that front. Meanwhile, I note that the US output gap has now vanished (Exhibit 5). It is therefore fair to say that there is currently little slack overall in the US economy. Plenty of economic slack in the post-crisis environment is very much why inflation has been so modest in recent years – not only in the US but worldwide. If economic slack has now largely disappeared, at least in the US, rising inflation and a more aggressive FOMC is only what can be expected. As I have already pointed out, it was the fear of a more aggressive Fed (FOMC) that suddenly crept in and spoiled the party for equity investors – at least temporarily. Only twice in the last 20 years have we seen the Fed turn more hawkish. It happened under Greenspan’s stewardship in 1999 and again when Bernanke started to get cold feet in 2006, and I probably don’t have to remind you what happened to risk assets in both those cases in the months and years that followed. By making that observation, am I suggesting we are in for a repeat of the dreadful conditions of the dotcom bust or the Global Financial Crisis? Not quite. The Global Financial Crisis of 2007-08 marked only the second occasion in the last century where all wheels temporarily came off the global economy (the first being the Great Depression of the 1930s). That said, it is my firm belief that we have never properly exited the Global Financial Crisis. We are still saddled with many of the problems that nearly took us all down in 2007-08, and I believe something dramatic has to happen before we can wipe the slate clean. In other words, they key is the ability to spot what will wipe that slate clean once and for all, and how to position oneself accordingly. What is it that needs to happen before we can finally put the Global Financial Crisis behind us? In a highly indebted economy, like the one we are currently in, I believe what is required is debt destruction. I would argue that debt destruction is the only way for society to start on a fresh, when the ship is about to sink. Now, debt destruction can happen in two ways – either through default or through inflation. (Note: At least, these two ways are the only two ways debt has ever been destroyed before. Ever!). The former we experienced in the great Depression of the 1930s and again more recently in the Global Financial Crisis; the best example of the latter is the 1966-81 period, where the Vietnam war and two oil crises played havoc with inflation. If I were a voting member of the FOMC, the MPC or similar, I know which of those two outcomes I would prefer. A bit of inflation will most definitely do some damage, but it won’t take the global economy down, like a re-run of 2008 could possibly do. Am I the only soul in the entire world thinking along those lines? I don’t think so, and the behaviour of equity markets in late January and early February suggests to me that I am not. Have we retired the risk-on/risk-off mindset? For many years, inflation fears dominated the mindsets of investors, and the correlation between equity and bond prices was positive – i.e. during periods of rising inflation expectations, bond yields would rise and equities would tumble. That mindset prevailed from 1966 to 2001. That all began to change in late 2001, when the correlation between the two suddenly turned negative. Investors began to fear deflation more than inflation, and saw rising bond yields as a positive thing. Consequently, equity returns were positive during periods of rising bond yields. Wall Street even invented a term for this radical change in investor behaviour. Observers frequently commented that a risk-on/risk-off mentality had taken over. What has happened in the last few weeks is that the old mindset of 1966-2001 has made a comeback. How do I know that? I suggest you take a long look at Exhibit 6, which suggests that the risk-on/risk-off mindset of recent years is rapidly breaking down. 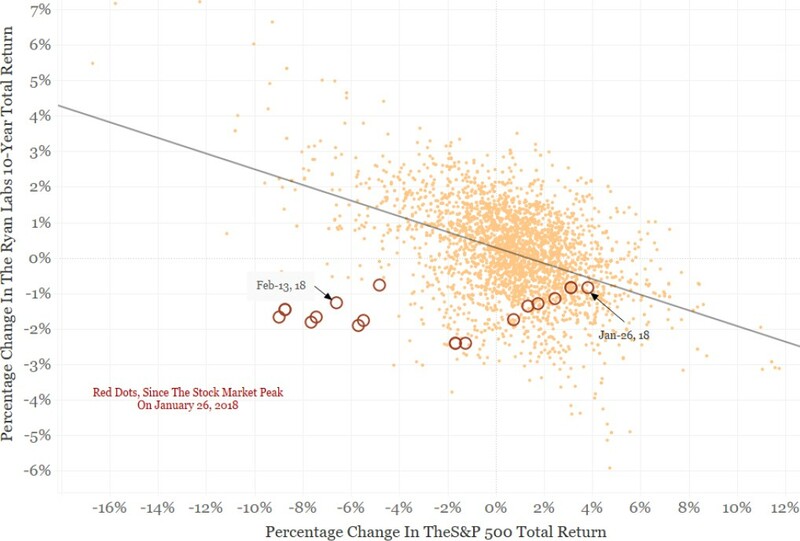 As you can see, since late January, the 15-day correlation between the total return on equities and bonds have moved to the bottom left quadrant of the chart, which suggests that investors now fear inflation again – for the first time in many years. There is a little “but”, though. On the 13th February, after the US government had released new CPI data, suggesting consumer prices had risen more than expected in January, pre-market trading on NYSE was very negative, and everybody expected another bloody day on Wall Street, but it never happened. Instead, after a nervous (but not extraordinarily negative) start, US equities recovered and ended the day with respectable gains. If my conclusion above, that investors now fear inflation more than they fear deflation, is correct, how could that possibly happen? I have been thinking long and hard about that one because, quite clearly, something doesn’t add up. The best explanation (yet) was provided to me by Sushil Wadhwani, whom I bumped into shortly after the ‘incident’. Sushil is an ex-member of the Bank of England’s Monetary Policy Committee (MPC), and is one of the best readers of investor behaviour I have ever come across, so I always listen very carefully when he speaks. According to Sushil, it takes time for investors to buy into a new storyline which, in this case, is a new inflation regime. Think back a few years, and you would probably agree that it took an awfully long time before the majority of investors subscribed to the low-growth and low-inflation environment that we have been in for a while. Now, it is hard to find anybody who takes a different view. It is therefore only logical that we don’t go in a straight line from one regime to another. If you wish to learn more about Sushil and his work, I suggest you take a look at www.waniasset.com. Should Deutsche Bank be anywhere near correct in its analysis of future inflation trends, US interest rates can only rise further from current levels. The 10-year US Treasury bond is already the highest yielding 10-year OECD government bond but, in a historical perspective, the yield is still very low at a tad below 3%. I have a hunch (but it is only a hunch) that the world’s central bankers would actually like for inflation to come in somewhat higher than 2% for a while, and there are (at least) three reasons for that. Firstly, it would generate a perception of some sort of return to normality, which would simplify many things. Secondly, the higher inflation is relative to interest rates, the more debt will be destroyed in the debt destruction process I referred to earlier, and debt destruction through inflation is certainly to prefer rather than debt destruction through default. Thirdly, higher interest rates could suddenly bring a very sick DB pension industry back to life, which would lift a huge burden off government’s shoulders. I note that many DB schemes are already on the ventilator, but a 10-year government bond yielding around 5% would allow many of those very sick schemes to leave hospital altogether. Once you take the present circumstances into consideration, allowing inflation to run a litre bit higher for a while is therefore not as outrageous a policy as it sounds, but I am prepared to bet quite a bit that you’ll never find a central banker anywhere prepared to admit as much. Could it all end up in a deflationary bust? As I did my research in preparation for this month’s Absolute Return Letter, a most interesting research paper from our preferred research provider – MacroStrategy Partnership LLP – suddenly dumped through the letterbox. Julien Garran (the analyst behind this view) is of the opinion that the inflationary bust that began to unfold with the correction in late January and early February, will relatively quickly turn into a deflationary bust, where I am of the opinion that it will take much longer for the inflationary bust to run its course. You may ask the valid question – does it really matter? A bust is still a bust whether it is inflationary or deflationary. Yes, it does matter, because the investment strategy you need to apply is very different in the two scenarios. Commodities, for example, will most likely do much better in an inflationary bust than in a deflationary bust. One of Julien’s key arguments in favour of the deflationary bust outcome is that the combination of USD repatriation and a hawkish Fed would most likely lead to a stronger dollar, which would tighten global excess USD liquidity, and the tightening of USD liquidity would bring on the deflationary bust. The reason Julien and I have come to dissimilar conclusions is that we take a very different view on the Fed. If my hunch that central bankers want inflation to rise more than everybody expects (even if they are not prepared to admit so publicly) is correct, the inflationary bust is most definitely the most likely outcome. If Julien is correct that the Fed under Jerome Powell’s stewardship will prove more hawkish, a deflationary bust will almost certainly prevail. As Powell is still only weeks into his new job, in all honesty, none of us know for certain which way the Fed under Powell is leaning. Finally, as you shall see below, I would agree with Julien that, in the long term, there is definitely more deflationary pressure lined up. I just don’t think it is as imminent as Julien suspects it might be. Before wrapping up this month’s Absolute Return Letter, I should point out that, in the long run, I don’t disagree with Julien. The views I have expressed in the month’s letter are driven by cyclical factors, and I have chosen to ignore a number of structural factors, many of which I have pointed to in previous Absolute Return Letters. Inflation as well as interest rates are therefore likely to resume their downtrend at some point. This poses two risks for anybody wanting to ‘play’ the inflationary bust theme. Firstly, those structural factors that are likely to hold back inflation in the long-term could be so powerful that they overwhelm the shorter-term cyclical factors, meaning that inflation never takes off. The whole thing turns into a bit of a damp squib. Secondly, as I learned many moons ago, never underestimate the collective IQ of the investor community. Not all investors deserve to be compared with the sharpest knives in the tool box, but, on a collective basis, the market is still bloody smart. The implication of this is that, although everything I have predicted about short-term inflation in this month’s letter may turn out to be correct, investors on a collective basis choose to ignore it, as they know inflation will come under (considerable) downward pressure again. With those two caveats in mind, though, I am still going to suggest extreme caution in the months to come. We have entered shark-infested waters.